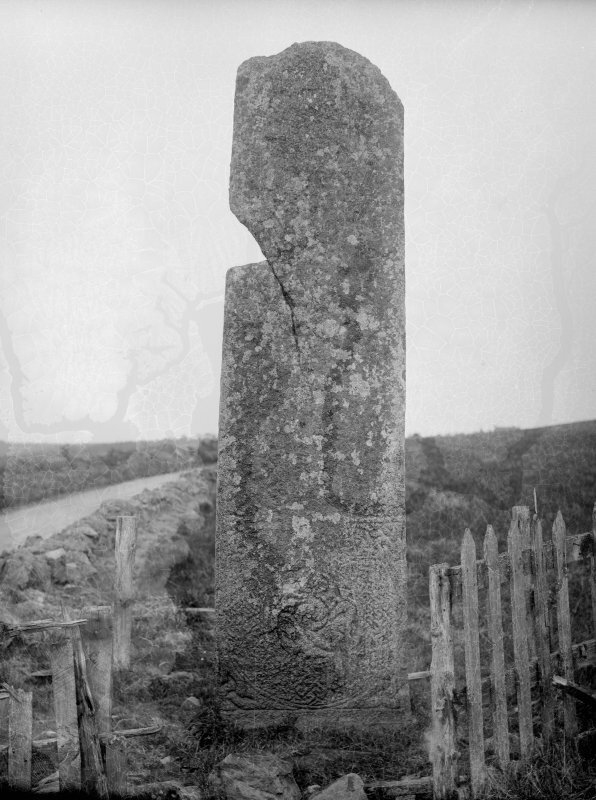 Scanned image of engraving of the Maiden Stone from Cordiner. 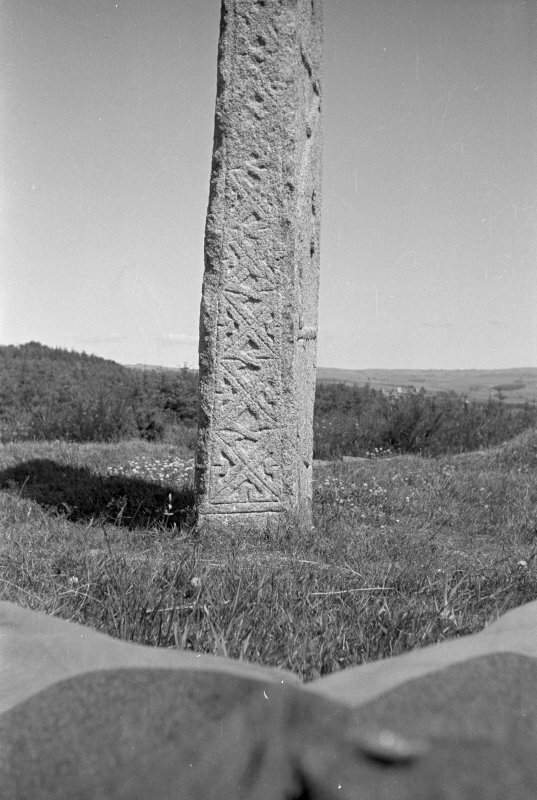 View of reverse of Maiden Stone Pictish cross slab. 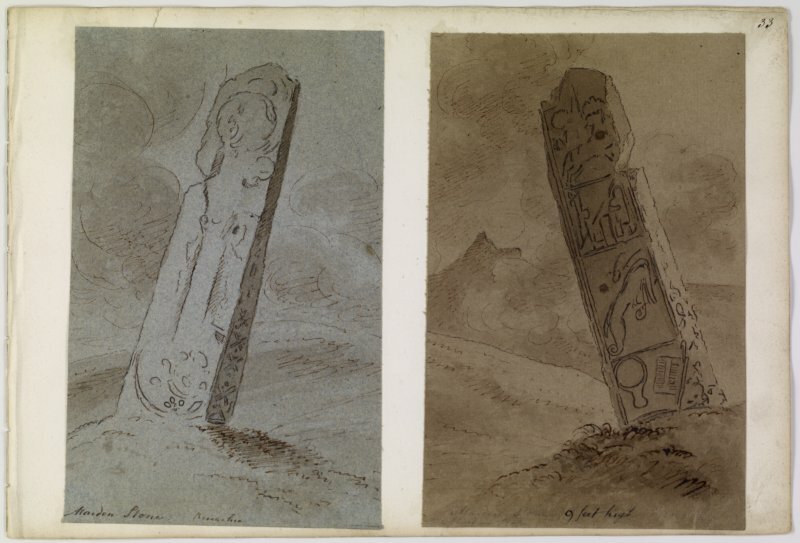 Annotated drawings of both faces of cross slab from album, page 33. Digital image of ABD/503/1/P. View of W face, dated 13 September 1995. Maiden Stone. 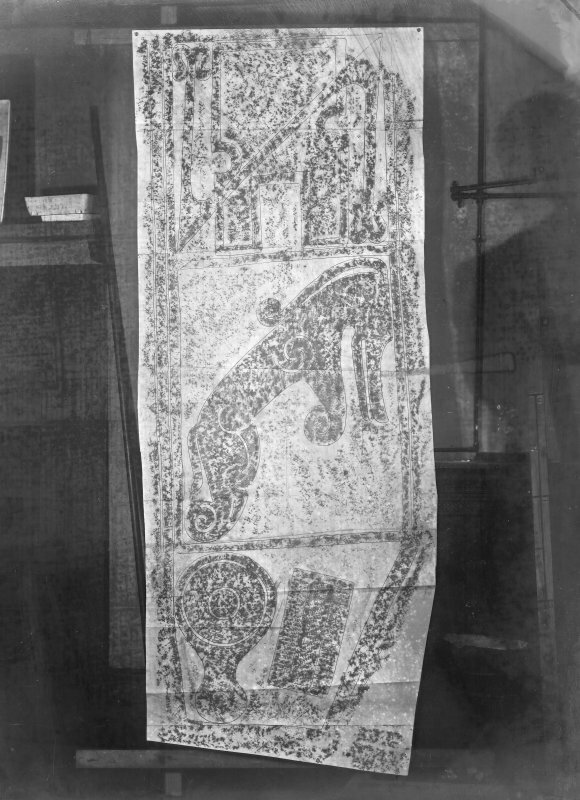 General view from E.
Photographic copy of rubbing showing the bottom three panels of reverse of the Maiden Stone Pictish cross slab, Chapel of Garioch. 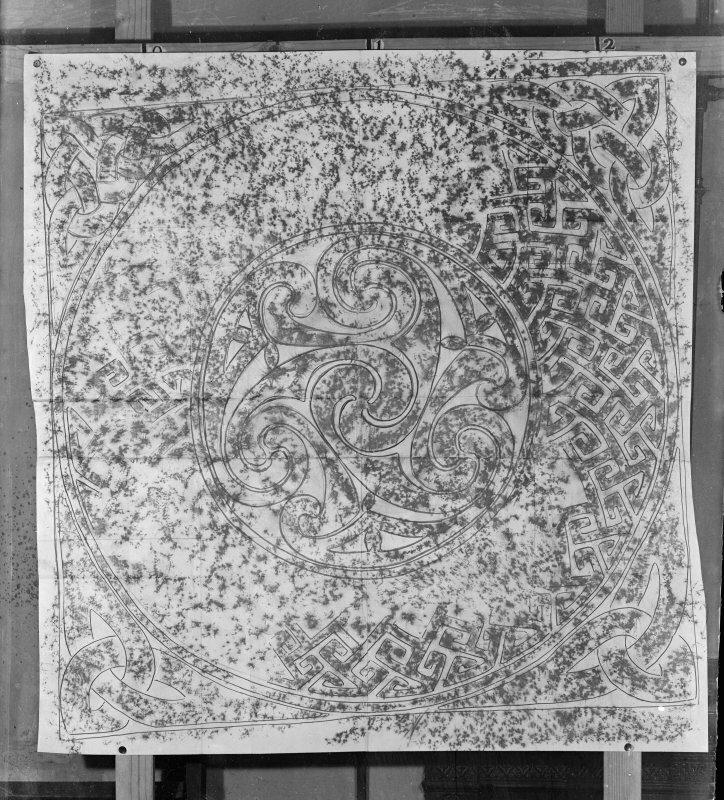 Photographic copy of rubbing showing the lower detail of the face of the Maiden Stone Pictish cross slab, Chapel of Garioch. 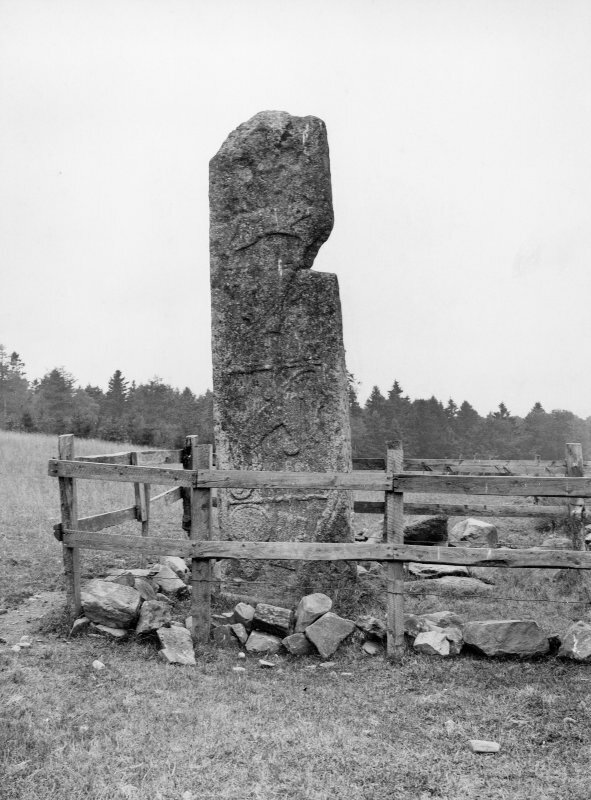 View of the Maiden Stone, Bennachie, from South. View of S edge, dated 13 September 1995. Maiden Stone. Detail on S side. 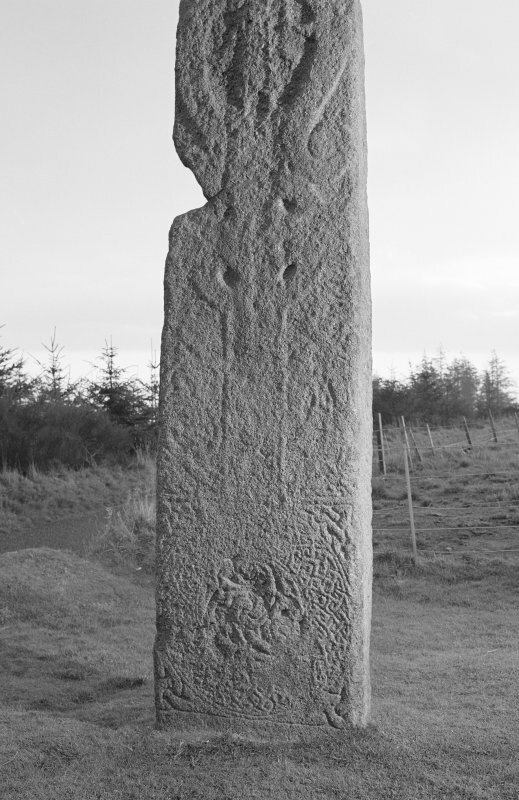 View of face of Maiden Stone Pictish cross slab. View of N edge, dated 13 September 1995. View of East face and side. View of the Maiden Stone, Bennachie, from North. 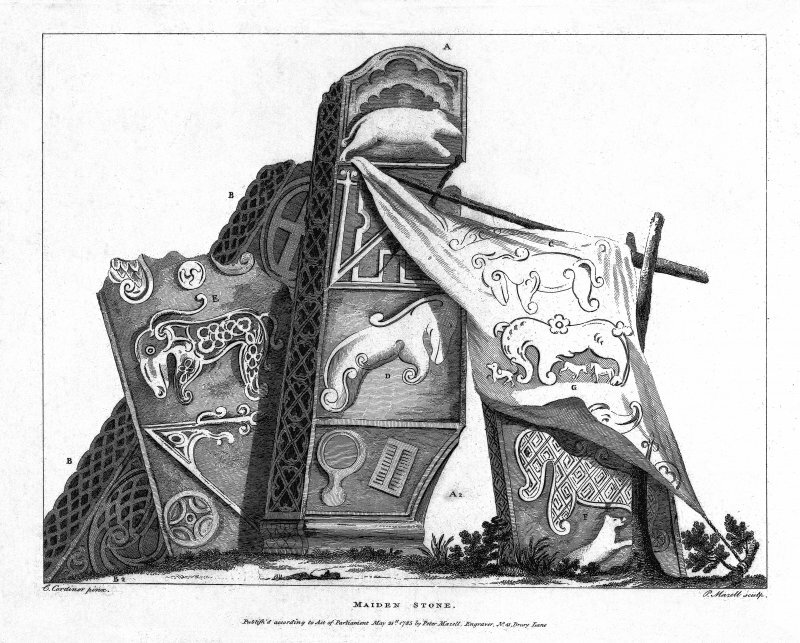 used as a kind of heraldry on memorial stones in the two previous centuries. 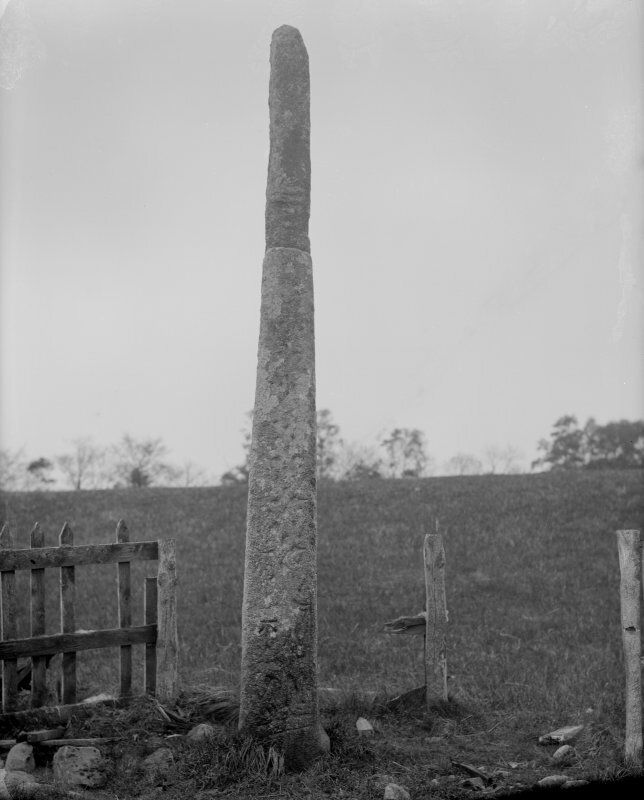 The cross side indicates its use as a preaching site during the conversion of the Picts. The notch out of the northern edge of the stone has fed a legend concerning the daughter of the laird of Balquhain who was baking bannocks on her wedding day and bet a stranger that she could finish her task before he had built a road to the top of Bennachie, 'ere she would become his own'. Being the Devil, he won: she took to her heels and, in answer to her prayers, was turned to stone as he caught her, the notch being the spot where he grasped her. The wonderfully monumental statue of Persephone, carved from 8.5 tons of millstone grit, which stands in a glade 100m to the west of the Maiden Stone, is a distant echo of the legend; in Greek mythology, Persephone was the daughter of Ceres, the goddess of corn and harvest. She was carried off to the underworld by Pluto, the god of death, to be his wife, but Jupiter, king of the gods, decreed that she should return on condition that she had eaten no food in the underworld. Because she had eaten the seeds of a pomegranate, she was allowed to spend only six months of each year with her mother. Her time in the underworld stands for the grain which for half the year is below the ground, but on her return the corn springs up and grows. The splendidly sensual statue is carrying a mirror in reference to the Maiden Stone. Present location: beside a minor road at NJ 70378 24714. Evidence for discovery: first recorded in 1726 and first illustrated in 1788 check, by which time it had already lost a triangular chunk from one side through natural fracturing. It appears to have stood on a small mound, but it was moved when the road was built, sometime between 1832 and the early 1850s. Its location near the foot of a gentle slope suggests that it may have stood beside an old trackway. Present condition: very weathered, to the extent that the original top of the slab is missing. 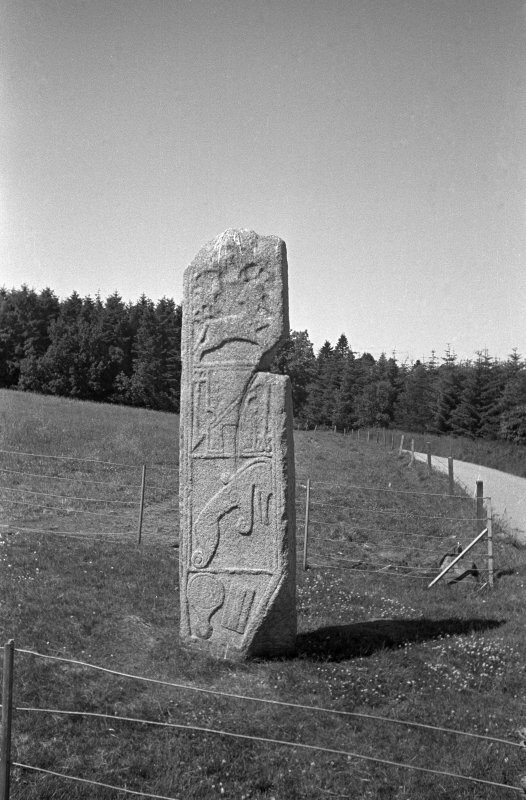 The way in which the top of this impressive slab has weathered, together with the disposition of the carving at the top, suggests that it may have had a rounded or triangular top. It was an irregularly shaped slab from the start, because face B is thicker than face D, and the lower corner of faces C and D had already fractured in such a way that the sculptor was obliged to ‘fold’ his panel of interlace on face D round the edge onto face C. All four faces have a narrow flatband border and the panels of ornament are separated by roll mouldings. it is carved in relief with some use of incision. Face A bears an ambitious design centred round a ringed cross. The cross and ring are outlined by a narrow roll moulding, and the arm terminals are squared. The side arms extend out to the sides of the slab, and the upper arm is longer than the side-arms. 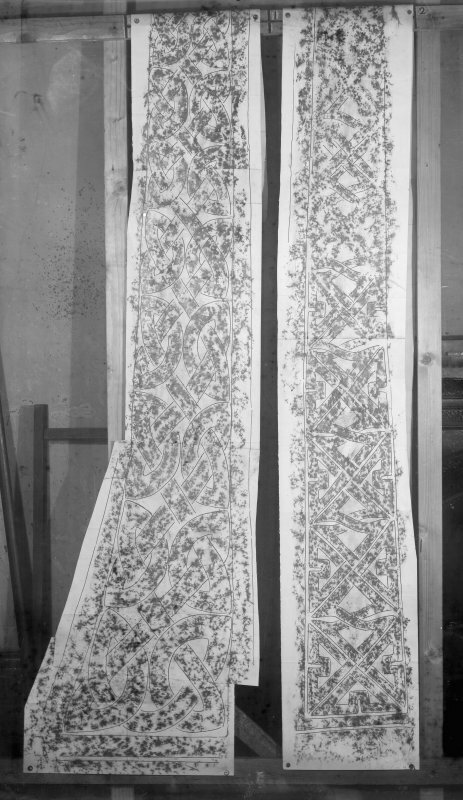 The entire cross is filled with faint traces of interlace. Standing on the upper arm is a frontal figure with a pointed beard and a nimbus around his head, dressed in a long tunic. He is guarded by two large S-dragons with spiral tails, facing him on either side, their snouts against the nimbus and their forelegs touching his arms. 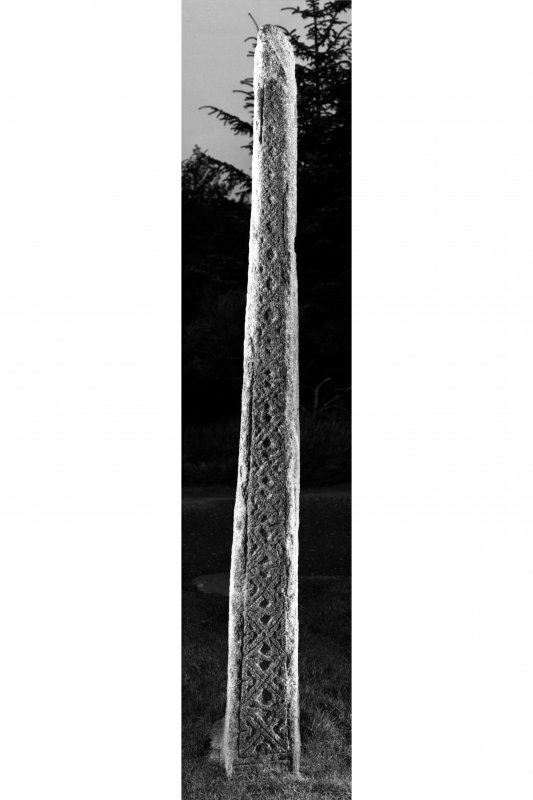 The panels on either side of the cross-shaft are filled with fat, possibly zoomorphic interlace. The lower square panel contains a great ring, outlined by roll moulding and filled with diagonal key pattern, with a central roundel filled by three interlinked triple spirals emanating from a central triple spiral. In the corners between the great ring and its enclosing square are mirrored pairs of interlace knots. 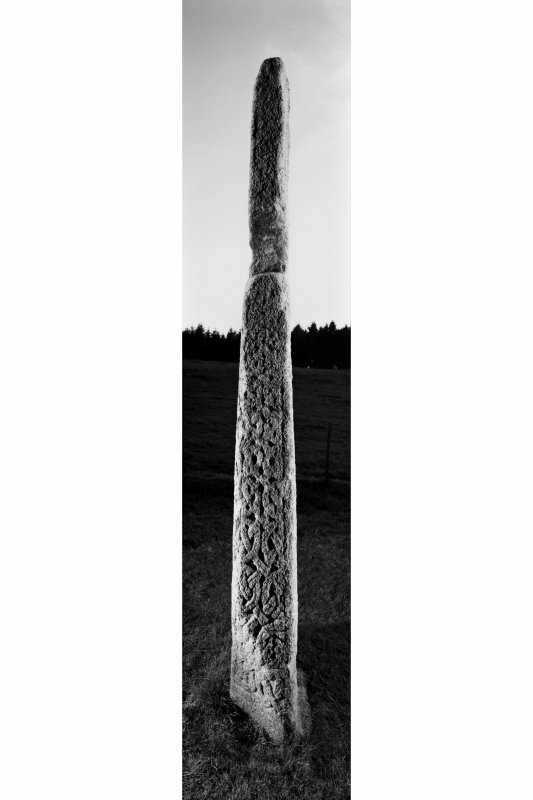 Face B is carved with continuous squares of triangular knots formed of median incised and interwoven cords. 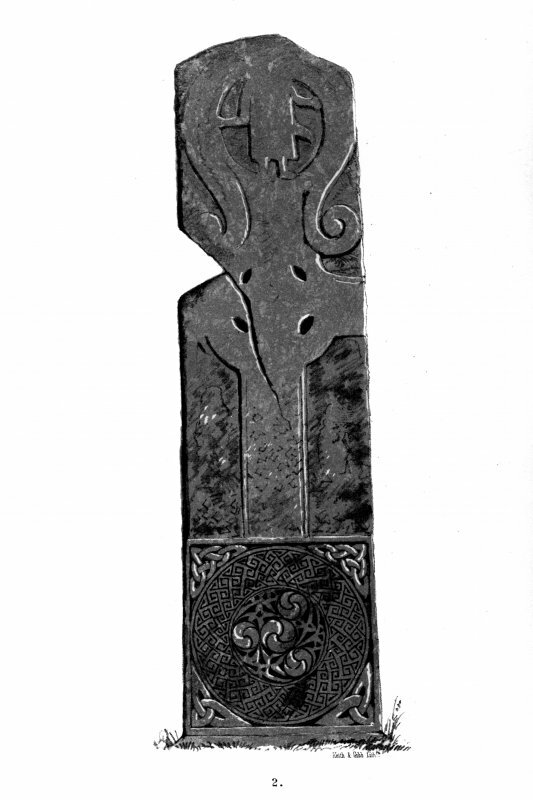 Face C has an inner moulding between the flatband border and the panels of ornament, and the way in which this inner moulding finishes at the foot of the slab suggests that it may have had a zoomorphic character and that there may have been animal heads in the missing top of the slab. 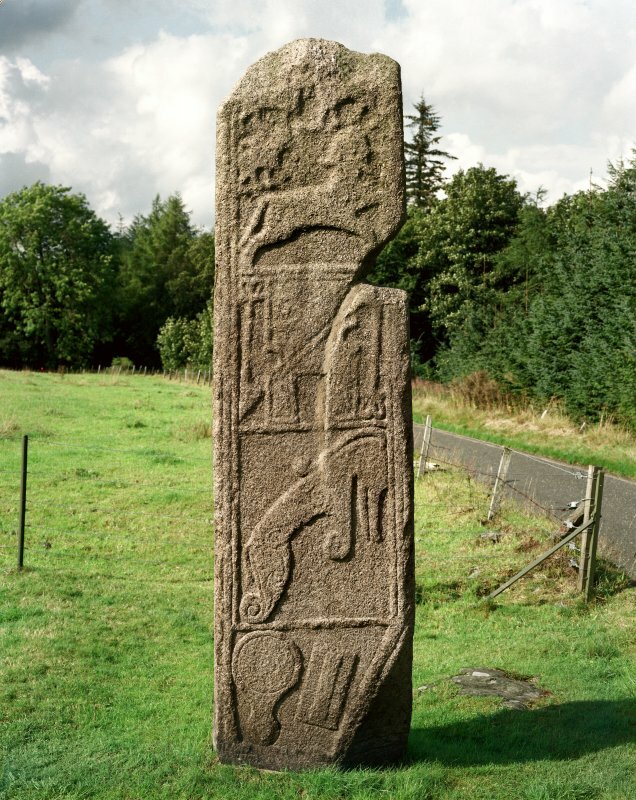 This face is divided horizontally into four panels: the lowest panel contains a mirror and double-sided comb, the panel above has a Pictish beast facing right, the next a notched rectangle with Z-rod and the top panel contains four animals. The lowest appears to be a leaping centaur with a quadruped in the distance behind him, and above there is a pair of confronted quadrupeds or possibly centaurs. Face D is carved with continuous pairs of knots formed of median-incised cords. There is an Ordnance Survey bench mark incised into the interlace close to the base. Date: eighth or ninth century. References: Gordon 1726, 162; Cordiner 1788, 33-4; Stuart 1856, 3, pl 2; ECMS pt 3, 189-91; Fraser 2008, no 33. As described and illustrated. The W face (the front) is much more weathered than the E and the symbols are scarcely discernible. Visited by OS (ISS) 10 July 1973. A trench was lately made round the stone but no sepulchral remains were found and it was subsequently discovered that the stone had probably been removed a few paces westward from its first site when the adjoining road was made. 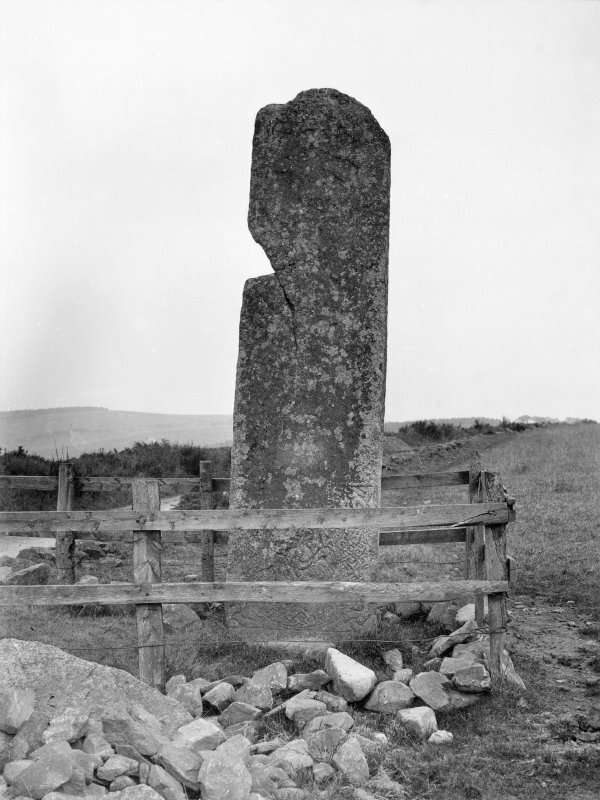 The stone stands south of the road running out west of the Chapel of Garioch. The name 'Maiden Stone' is said to come from a daughter of the Laird of Balquhain who was killed here in a scuffle subsequent to her elopment. A Class II symbol-bearing, upright cross slab of red granite, carved in relief and standing 10' (3.04m) high by 2'8" - 3' (0.81-0.91m) broad and 6" - 1" (152-304mm) thick. The front is divided into 5 parts, the back into 4 panels. Besides the cross the front bears a man between two fish-monsters and on the back are a centaur-like figure, rectangle and z-rod; elephant and 'mirror and comb' symbols. The sides have panels of interlacing. One of the most beautiful stones to have survived in situ, it is not erected on a base, but the bottom is left rough and stuck in the ground. 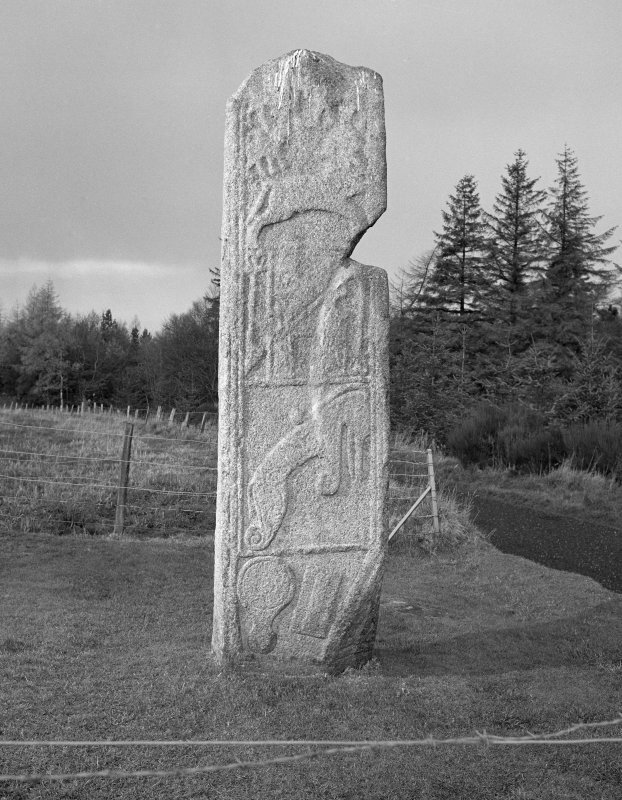 This beautiful pillar of red granite stands beside the by-road 1 mile NW of Chapel of Garioch. 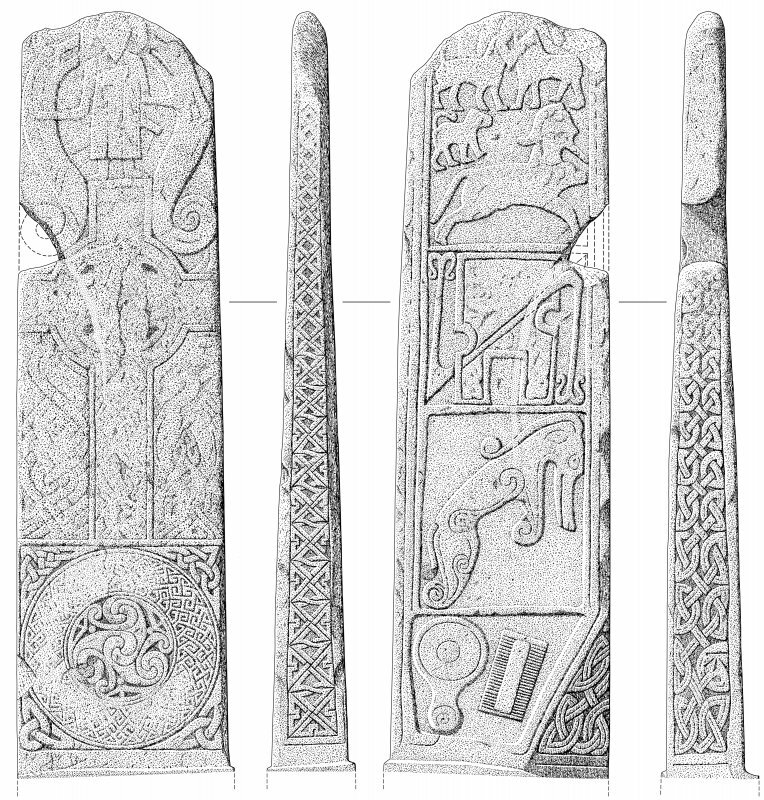 It is a Class II stone, carved in relief, showing at the front a man between fish monsters, an enriched cross and shaft, a panel with an enriched disc, and other ornamental details. The back has beasts and a centaur-like figure, a rectangle and Z-rod, an 'elephant' and a mirror and comb symbol. This sides have interlaced panels. This stone is one of the most beautiful to have survived in situ. 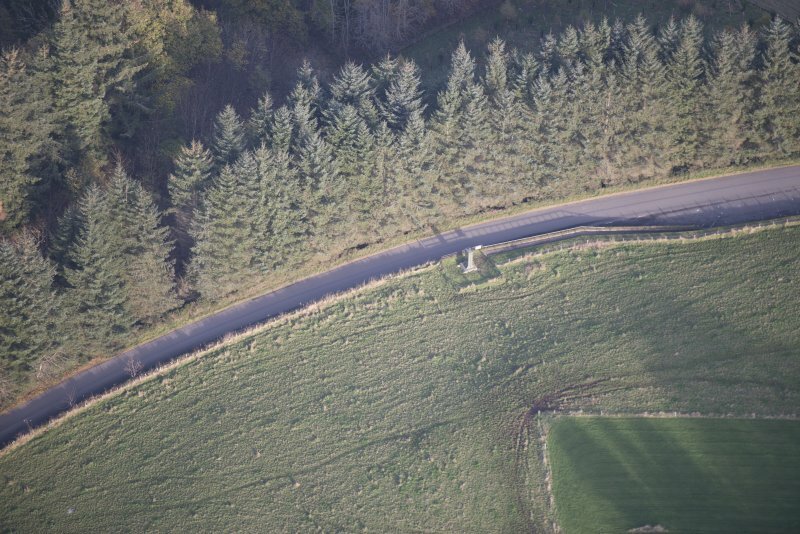 This stone is situated on the hill-flank at an altitude of 155m OD. The cross-bearing side faces W and weathering is evident on both faces. (GRC/AAS photography and additional bibliography listed). NMRS, MS/712/71, visited August 1975, July 1978, July 1986 and 23 August 1990. NMRS, MS/712/71, visited July 1978. Visited by Grampian Regional Council archaeologists. NMRS, MS/712/71, visited July 1986. 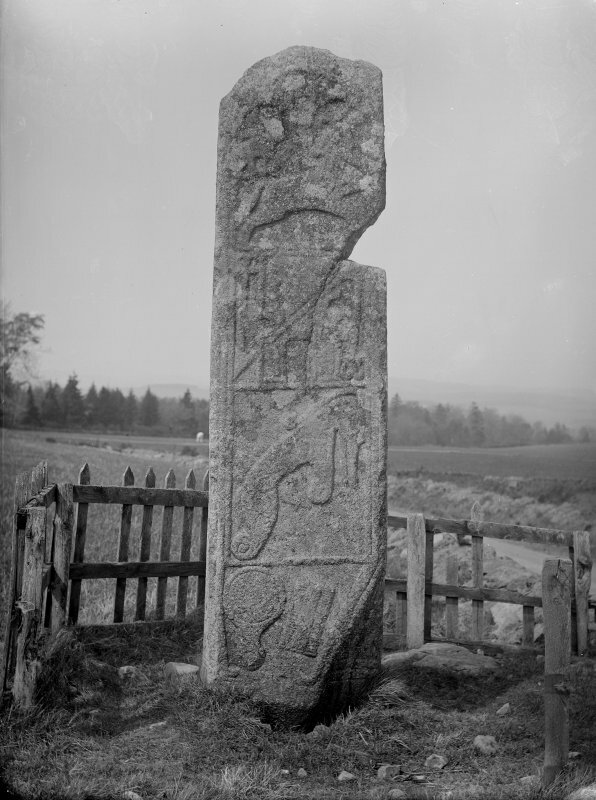 Named from the legend of the daughter of the laird of Balquhain who died during her elopement, this is a cool pink slab of granite, bearing on one face, in low relief a most elaborate and confIdent ring-headed cross and on the other four bold symbols, carved in high relief Above the cross on the west face two fish monsters surround a man with arms outstretched (a Calvary scene?). Below the cross a great roundel with spiral work surrounded by interlace, key-pattern and knotwork can still be discerned. The sides of the slab have also been carefully decorated. The east face has been divided into four panels, bearing a centaur (? ), a notched rectangle (?based on a gate tower) and Z-rod, a Pictish beast and a mirror and double-sided comb. These have all been carved with a 'massive simplicity' that was an elegant and successful response to the problem of executing relief sculpture in granite. 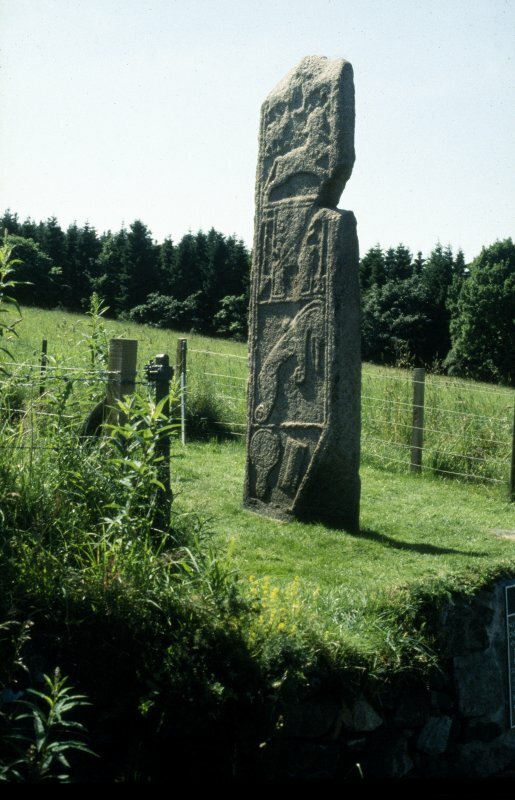 The cross, the treatment of the symbols and their framing in separate panels on the back of the stone all suggest that this was one of the last symbol stones to be carved in Grampian. It is certainly one of the finest. Information from ‘Exploring Scotland’s Heritage: Grampian’, (1986). Visited by Aberdeenshire Archaeological Service. NMRS, MS/712/71, visited August 1990. 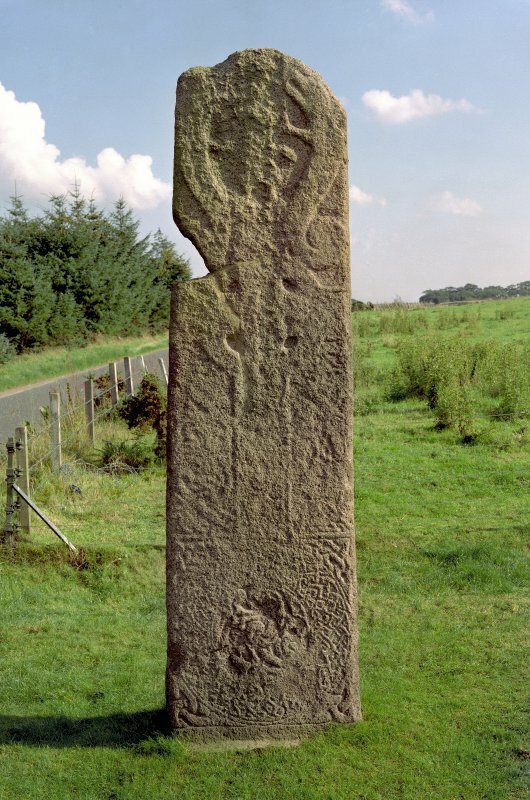 Named from the legend of the daughter of the laird of Balquhain who died during her elopement, this is a cool, pink slab of granite, bearing on one face, in low relief, a most elaborate and confident rin gheaded cross and on the other four bold symbols, carved in high relief. Above the cross on the west face two fish monsters,surround a man with arms outstretched (a Calvary scene?). Below the cross a great roundel with spiral work surrounded by interlace, key-pattern and knotwork can still be discerned. The sides of the slab have also been carefully decorated. The east face has been divided into four panels, bearin g a centaut (? 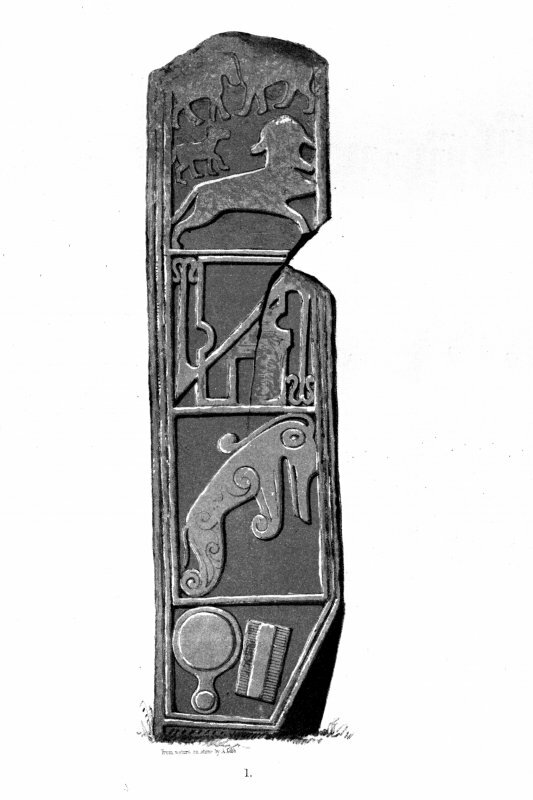 ), a notched rectangle (?based on a gate tower) and Z-rod, a Pictish beast and a mirror and double-sided comb. These have all been carved with a 'massive simplicity' that was an elegant and successful response to the problem of executing relief sculpture in granite. Information from ‘Exploring Scotland’s Heritage: Aberdeen and North-East Scotland’, (1996). 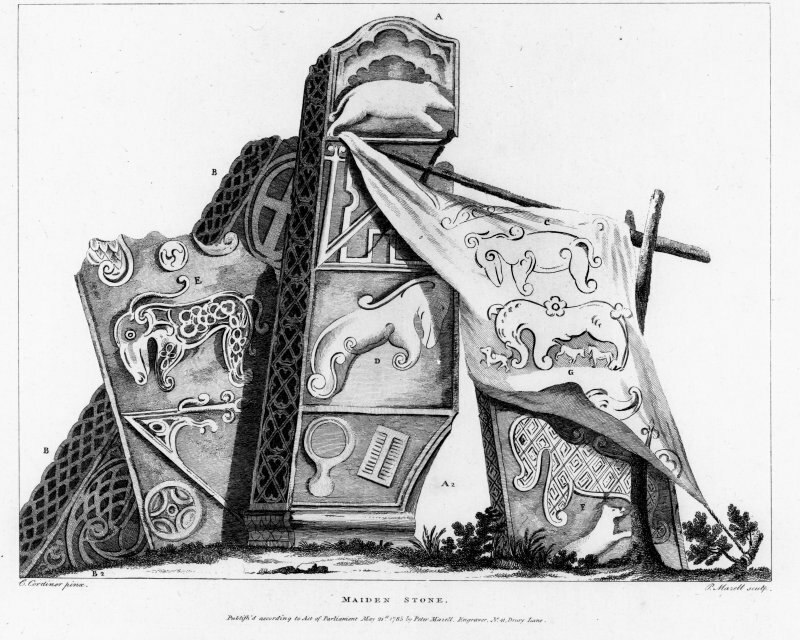 Class II symbol stone (the Maiden Stone) : on the reverse are four panels showing beasts and a centaur beside a divided rectangle and Z-rod which are over an elephant and a mirror-and-comb. A Mack 1997; (Undated) information in NMRS. Archaeological monitoring was carried out at the Maiden Stone, Inverurie, Aberdeenshire on the 31st of July while a minor excavation was undertaken by MCU with regard to the positioning of a new fence strainer post. The site of the new post lay along the E side of the HS perimeter fence. It was noted that this area had recently been extensively pitted to take the posts for the new Aberdeenshire Council fence that had been positioned around the outside of the existing HS fence. 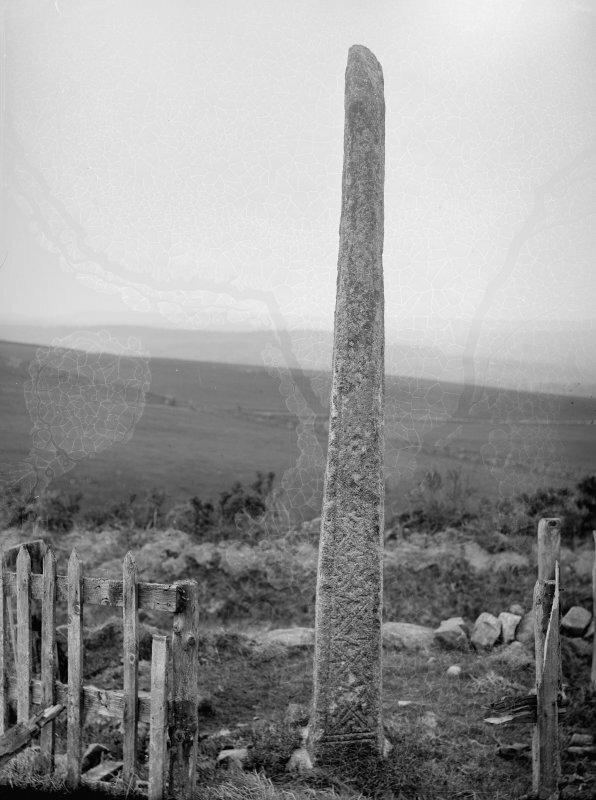 It was also noted that local knowledge suggests that the Maiden Stone was originally positioned away from its present site which may have removed any hope of locating contemporary archaeological evidence. The layers uncovered by this work seem to represent a normal field soil sequence. Top soil seals which in turn overlies undisturbed natural material. The absence of cuts or subsoil disturbances or even finds of any variety lends credence to the idea that this present setting for the Maiden Stone is indeed secondary. adjacent road was built, requiring its relocation to its present position. the newer location may well contain sensitive archaeological deposits. The exposed features were recorded in detail before backfilling.